I appreciate it when journalists, writers and other well-to-do people decide to blog about growing (apparent, nagging, etc.) problems in the U.S. Their efforts are supposed to bring attention and amongst all things, call others to action. I read this article last week and it piqued my interest in more than one way. Personally, I've had to cut my food costs by about 60% due to the economic meltdown the country is experiencing right now. 60 percent is a lot. More than half. Since it's just me, it's hard to just cook for one. Any single person can tell you that little tidbit of information. I can barely imagine families of three or more people squeaking by on what I have to use as a solo entity. On that note, I've been making tons of soup and sandwiches for my meals. 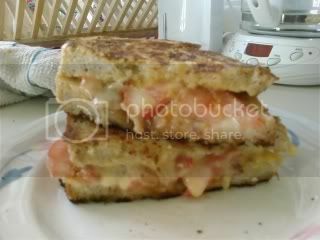 This is my super-stuffed grilled cheese sandwich. Laced with tomatoes, cheddar, bacon, and white onions, the only thing missing on this sandwich are potato chips and a Tastykake. In a saucepan, heat olive oil over medium-low heat. Add the celery, carrot, onion and garlic, cook until softened, about 10 minutes. Add the tomatoes and any tomato juices, water, and bay leaf. Simmer until vegetables are very tender, about 15 to 20 minutes. Add basil. Puree with a hand held immersion blender until smooth, if desired. To me one of the hardest parts of cooking for one was the waste. When you size down a recipe you are left with some may parts of things. Does that make any sense? Luckily soups of pureed veggies are so delicious. One of my favs is butternut squash soup. That sammich made my stomach do flipflops in a good way. 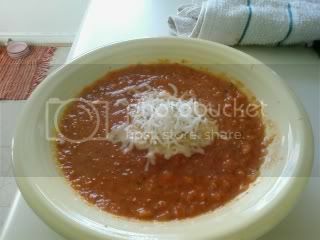 I love a great tomato soup!!! LOVE - LOVE - LOVE! That soup and sandwich look DELICIOUS! Nice to see you back - and with such delicious looking things!